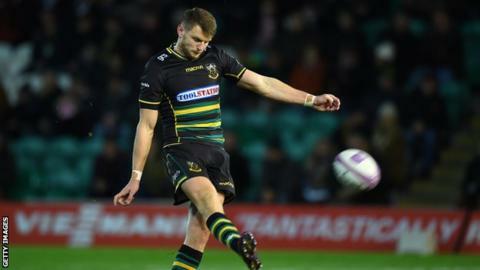 Premiership Rugby will not release non-English players for World Cup camps next year unless World Rugby changes its “false and unfair” insurance rules. The clubs are objecting to certain restrictions over payouts if players are injured on international duty. As it stands England-based Scotland and Wales players will be unable to join their national squads until mid-August. “All we are asking for is the same sort of system that exists in football,” said Premiership boss Mark McCafferty. “If we release players for international duty and they are injured on international duty, then the international game should bear the liability for that. “We have made that position very clear to World Rugby,” he told BBC 5 live. World Rugby Regulation 9 means clubs are only obliged to release players in mid-August. The World Cup runs from 20 September to 2 November. However, most international sides will have training camps throughout the summer before warm-up matches in August. Wales have a training camp in Switzerland in July, before their first two two warm-up Tests – both against England – on 11 and 17 August, while Scotland have Tests against France on 17 and 24 August. “We will let the players go of course to the World Cup in accordance to Regulation 9, but we are not going to go beyond Regulation 9 if we are being mistreated in the system generally,” McCafferty said. World Rugby has lifted the insurance cap from £225,000 to £350,000 if a player is injured on World Cup duty, even if his salary exceeds that amount. The insurance only covers a 12-month period. The insurance policies of both the British and Irish Lions and the Barbarians covers the club for the full amount of liability if a player is injured. “There are limits [World Rugby] put either on the salary of the player – and there are a lot of players above that salary – or the term of the injury [12 months],” McCafferty said. “Those kind of limitations, we think, are false and unfair. “If a player is earning X, then that is his cost to the club, or if he is off for longer than a year, then the liability should be covered. That is what exists in football, that’s what the Lions cover for us when the players are away on a Lions tour, it’s what the Barbarians do as well. “So we don’t understand why there should be any difference in terms of World Rugby.